AmeriGuard’s Pest Defense service begins with a licensed technician providing a full inspection of your residence and property to identify the variety of beetle infestation and determine whether the pest is a General Pest beetle, Pantry Pest beetle or a Carpet beetle. During the inspection, your beetle control technician will identify potential problem areas around your home or office. After the source of your problem areas have been identified, your technician will point out other potential beetle harborages and steps you can take to reduce future beetle infestations. Your technician will create a customized beetle treatment plan for year-round protection, using the most effective and environmentally-conscious beetle control solutions. Considering organic beetle control? With AmeriGuard’s botanical pest control programs, we can provide natural alternatives to traditional inorganic pesticides. Green pest control products do not have as long of a life span as traditional non-organic pesticides and must be re-applied on a monthly basis to offer effective beetle control. For more information on our organic pest control alternatives, please follow the link below. With AmeriGuard’s Beetle Defense Program, not only will we control your current beetles, but help prevent any future beetle outbreaks. Most beetle infestations originate outside, your technician will focus on the perimeter of the home and outlying areas of the yard. In addition to exterior beetle treatments, we can also treat the interior of your home to stop beetles from entering. Future service treatments will be exterior-only, without requiring you to be home or having to worry about scheduling conflicts. 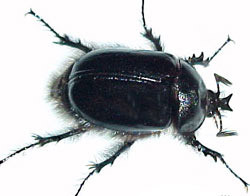 AmeriGuard offers Monthly, Bi-Monthly and One-Time beetle services with no contract required. Both the inside and outside of your home are always under warranty. AmeriGuard Pest Defense guarantees your satisfaction between regular scheduled maintenance services with unlimited free re-services for Monthly, Bi-Monthly Pest Control customers. If at any time you find yourself in need of an additional treatment between regular scheduled services, call us and we will return to re-treat your home absolutely free! We can provide this service in Hemet, San Jacinto, Menifee, Murrieta, Temecula, Perris, French Valley, Winchester, Beaumont, Banning, and surrounding areas.